1) Medical group name – practice that you are receiving a bill from for services rendered. 2) Guarantor information – guarantor name, patient account number, and statement date. 3) Account status – message to patient regarding insurance status for this statement. 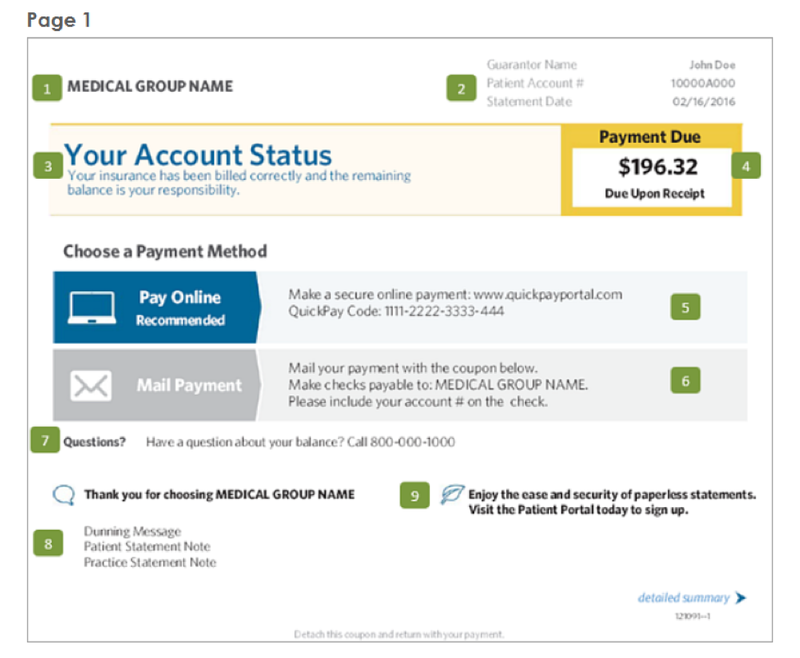 4) Payment due – amount patient currently owes and date payment is due. 5) QuickPay URL and code – access information for utilizing the quick pay convenience for your outstanding balance. 6) Mail payment information – instructions for how to mail in your payment. 7) Questions – practice telephone number for patient billing questions. Dunning message – tells you the status of your balance. Patient statement note – notes from practice about actions needed on your account. Practice statement note – notes from practice about announcements and other pertinent information regarding your account with our office. 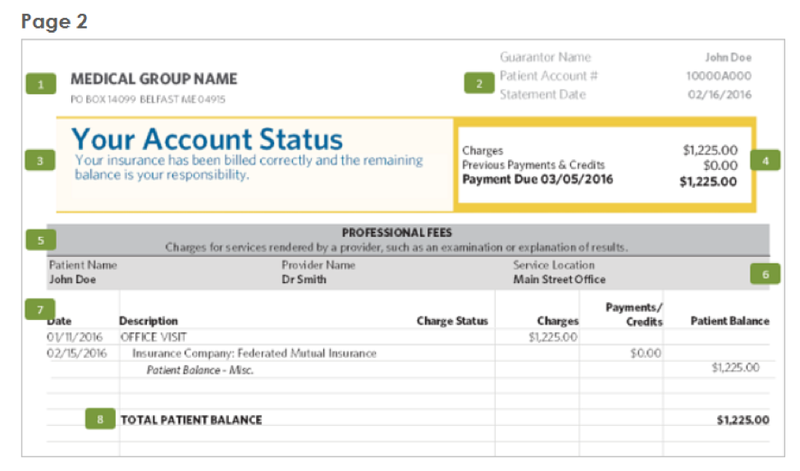 9) E-statement message – informs you how to access the Patient Portal to turn on a “paperless statement” option. 1) Return address – address where undeliverable mail is returned. 2) Guarantor’s address – address where the statement is mailed. 3) Insurance/personal information update – check this box if the guarantor’s address or insurance information needs to be updated. 4) QuickPay URL and code – access information for utilizing the quick pay convenience for your outstanding balance. 5) Statement due date – the date your patient payment is due. 6) Patient account number – your practice identification/account number (please use this number when you call in with questions about your bill or account). 7) Amount due – the amount owed by you for the current statement period. 8) Amount enclosed – please write the amount included with your payment coupon when you send in your payment for processing. 9) Pay-to address – address where your payment gets mailed. Please update your account information if anything has changed since your last appointment (i.e. name, address, phone number, insurance plan, identification number, etc). 4) Charge detail summary – sum of the statement charges, any insurance or patient payments applied, the outstanding balance, and the due date. 5) Charge banner – identifies charges along with descriptions of each service. Patient name – patient who received the service. This name may be different than the guarantor. Provider name – the rendering provider for the day’s service(s). Service location – the department name where the service(s) took place. 7) Charge details – service description and the amount charged. Any insurance payments or adjustments, patient payments, and provider adjustments follow. The remaining patient balance noted on your statement is one of the following reasons: co-pay, deductible, co-insurance, or miscellaneous. 8) Total patient balance – displays the total outstanding balance on the patient account.